Traditional digital library systems have certain limitations when dealing with complex or sensitive (e.g. proprietary) data. Collections of digital libraries have to be accessed individually and through non-uniform interfaces. By introducing a level of abstraction, a Meta- Digital Library or MetaDL, users gain a central access portal that allows for prioritized queries, evaluation and rating of the results, and secure negotiations to obtain primary data. This paper demonstrates the MetaDL architecture with an application in brain imaging research, BrassDL, the Brain Support Access System Digital Library. BrassDL is currently under development. 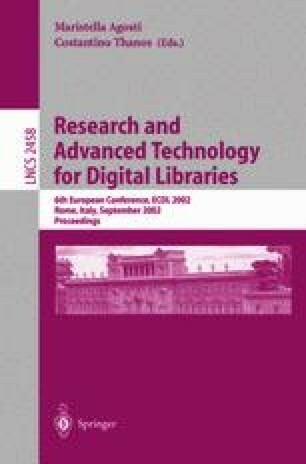 This paper describes a theoretical framework behind it, addressing aspects from metadata extraction and system-supported negotiations to legal, ethical and sustainability issues. European Computerised Human Brain Database (ECHBD). http://fornix.neuro.ki.se/ECHBD/Database. D. Krotz. PET and MRI race to detect early Alzheimer s. AuntMinnie.com, January 2001. http://www.auntminnie.com/index.asp?Sec=nws&sub=rad&=dis&=50098. The Organization for Human Brain Mapping (OHBM). http://www.humanbrainmapping.org.